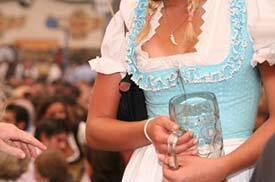 ABOVE: A waitress at Oktoberfest. The Munich Tourist Office has two information centers: one in the Neues Rathaus on the Marienplatz, and another at the Hauptbahnhof or main railroad station. Hours vary according to the season and the day of the week. The Germany Tourist Board's international site has icons for local sites in more than two dozen countries or regions, including the United Kingdom and the United States and Canada. The state of Bavaria's tourist-information site is worth a visit if you plan to travel outside of Munich. Top photo copyright © Tom Gufler.